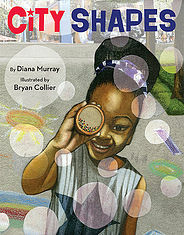 Today we feature talented author, Diana Murray to the KidLit411 Spotlight! 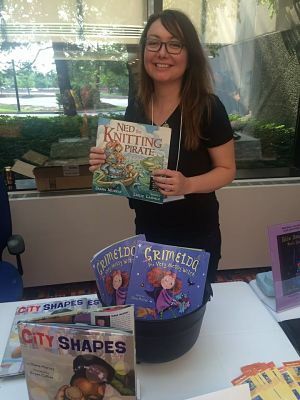 Be sure to enter the giveaway for three of her books- CITY SHAPES, illustrated by Bryan Collier, GRIMELDA THE VERY MESSY WITCH, illustrated by Heather Ross, and NED THE KNITTING PIRATE, illustrated by Leslie Lammle! 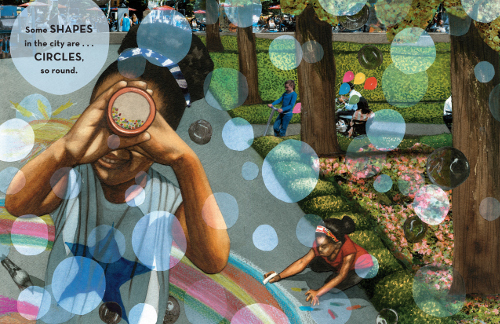 Tell us about background and how you came to write for children. In college, I studied psychology with an emphasis on child psychology. I also minored in art. I worked as an art director in graphic design for many years. When my first daughter was born, I left work to stay home with her. We started reading loads of picture books together. That’s when I started to fall in love with the genre, as well as the experience of reading together with a child. There’s something so warm and special about it. I joined SCBWI in 2007 and began writing every day. I signed with my agent in 2012. You will have gone from a debut picture book author to a multiply-published (four books!) author within a six month period: CITY SHAPES (June 2016), GRIMELDA THE VERY MESSY WITCH (July 2016), NED THE KNITTING PIRATE (Aug 2016) and GROGGLE’S MONSTER VALENTINE (Jan. 2017). Can you give us the behind-the-scenes story about how all these came to be published so close together? GRIMELDA and NED both sold simultaneously to different publishers as soon as I signed with my agent. But both titles got delayed by two years. And yes, the wait was agonizing! Meanwhile, we sold CITY SHAPES. Even though that sold later, it ended up being my first release. GROGGLE sold even later, but because Sky Pony Press is a smaller publisher, they tend to work faster. Your stories seem very different. How do you decide what to write? Yes. Most of my books are wacky, character-driven stories. But a few are a bit more lyrical, like CITY SHAPES, which released in June, and SUMMER COLORS, which is another title coming from Little, Brown. Each story came about in a different way so it’s hard to answer that question. CITY SHAPES was inspired by my time living in midtown Manhattan and the long walks I used to take downtown. SUMMER COLORS was inspired by listening to the rain on my patio. 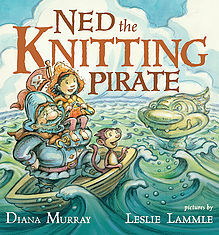 NED THE KNITTING PIRATE was inspired by an episode of Anthony Bourdain. GRIMELDA was inspired by my constantly losing things around the house. And GROGGLE was inspired by an illustration in the illustrator’s (Bats Langley’s) portfolio. I’m working on some revisions and reviewing illustrations for books I have coming out in 2017 and 2018. Also doing some freelance work writing content for an educational software company. And I’m always subbing poems to magazines, as well. Oh, and I just saw the color interiors for DORIS THE BOOKASAURUS illustrated by Yuyi Chen (Imprint/Macmillan), and boy, am I excited about that! I also have an early reader (PIZZA! PIZZA!) coming out with Random House’s Step-Into-Reading. That’s a new genre for me and I have ALWAYS wanted to do one of those. So that’s exciting for me, too. And of course, I’m also working on some brand new picture book manuscripts that I hope to submit soon. Getting the story arc right, making the concept unique, and having a good hook. Hmmm. I guess jotting down ideas. Because anything can have potential. Best not to edit yourself at the idea stage. What are the one or two things you did that most helped your publishing career? Signing with my agent definitely changed everything. That was a mixture of determination and luck. Also, it’s extremely important to find some good critique partners. And doing critiques is just as important as getting them. Joining SCBWI helped me make a lot of connections so I guess that’s how I ultimately found my main crit partners. That was huge. I had low self esteem when I was younger. So I guess I would say, you’re just as you should be. I’m obsessed with romcoms, Masterpiece Theater, and Jane Austen movies. 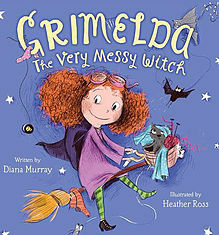 Diana Murray is an author of picture books and early readers including, CITY SHAPES (Little, Brown, June 2016), GRIMELDA: THE VERY MESSY WITCH (Katherine Tegen Books/HarperCollins, July 2016), and NED THE KNITTING PIRATE (Roaring Brook/Macmillan, August 2016). Her award-winning poems have appeared in magazines such as Highlights, High Five, Hello, Spider, and Ladybug. Diana grew up in New York City and still lives nearby with her husband, two very messy children, and a goldfish named Pickle. Congratulations on astounding success! Looking forward to reading your books. Wow! However it happened, you are on a roll. Your release parties will be busy! I've been eagerly awaiting your books! So many exciting releases! Congrats, Diana! Congratulations on your successes! Looking forward to reading all your new releases! I love all the advice, Diana, and the concise way you let us know about the inspiration behind each picture book. Hi, Wendy! Thank you! It's funny how you can be inspired by such random things. I love how you have displayed GRIMELDA in a witch's cauldron Diana! Congratulations on all your titles! Thank you, Diana, for sharing your journey with us. Congratulations on your writing success! Hi, Buffy! Thanks so much! Wow! Congratulations! Can't wait to read your books. Great interview! Congratulations, Diana, on all your books! How did u get into Random House's Step-into-Reading? I think that would be fun, too! Thanks, Tina! For the early reader, my agent subbed directly to one particular editor there. The editor said the first manuscript was too quiet, but she liked the voice, and welcomed me to sub something else. So I went back to the drawing board and tried to think really commercial. Lo and behold, they bought my next manuscript! But they changed my dog MC into a pig. :) I'd be happy to give you her name if you message me or email me. Your story is so inspiring! I loved City Shapes and can't wait to read the others! I just added all your books to my "To-Read" list on Goodreads. They all sound wonderful! Thanks for a great interview Diana and kidlit 411! Congratulations and looking forward to reading your books. Wow! Congratulations on your beautiful books! I am looking forward to reading them. Your post has inspired me. Thank you! Wow! You're amazing! You can turn so many ideas into great books for kids. Congrats on finding your gift to share. I love the peek into your book, City Shapes! I can't wait to share it with my class. Congrats on all of your success. Wow! That's quite a success story. Wishing you continued success, Diana. Congratulations on your book success! Thank you for sharing your writing journey. Congrats!